NEAFP is excited to announce that we have simplified our ordering process by opening up the ability to purchase singles of each of our products! As NEAFP has grown and the volume of orders coming in has increased over the years, there have been certain aspects of our pricing model that did not scale. As we move forward, we felt it was time to re-visit our pricing model for both Fiber Pricing and Wholesale to make it simpler on your end while making processing and fulfillment more streamlined on ours! Whether you need 1 pair or 400, you can now order exactly what you want in each item, size, and color - No more minimum product packages or mixed dozens! No More Custom Order Notes - Specify size and color of each individual item as you add them to your shopping cart! Save More when you Buy More - we are still offering Quantity Discounts on the majority of our products! Once you've added enough for the quantity discount, it will automatically be applied to your shopping cart! Simplified Categories - Fiber and Wholesale - Know Where You are Shopping! Just Say No to Custom Order Notes - Specify Size and Color for each product you buy! We know there is never a good time to raise prices but with the structure update comes some increases. In the last few years, the majority of our manufacturers have increased our costs. We've been able to absorb these increases and keep the majority of our product's price the same for the last 3 years but we've gotten to a point where we have to increase our product pricing in order to stay sustainable. We've thought long and hard on the best way to implement these increases, and after running several models we found one that fit. About half of our products received approximately a 5% increase at the 12+ quantity discounts. We wanted to keep the pricing increase as low as possible on our higher quantity purchases. We've increased the single price point slightly more than the original 3 pack price points. Although you are paying a slight premium to buy 1 of something, we believe that it will allow people to try out new products & see what sells in their community. As you try out new products and find success selling them, you can order at higher quantities to receive the bulk price discounts. With this change in pricing structure, we feel that we have simplified our pricing model for our customers while laying the groundwork for a processing and fulfillment system that reduces errors and increases scale-ability. For the last 20 years, NEAFP has helped thousands of alpaca farms of all sizes gain access to a variety of products Made in the USA on the commercial scale. With these changes, we are in a better position to continue to serve your growing needs for the next 20 years. Thank you for your continued support, the U.S. alpaca fiber industry would not be where it is today without it! 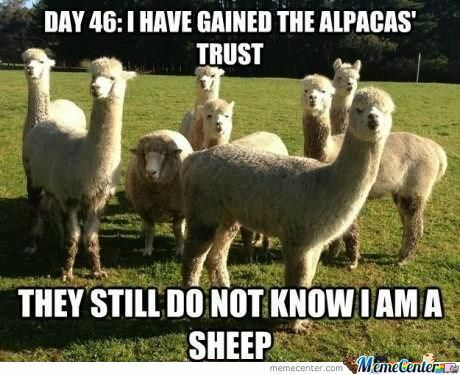 Article: Alpacas are SERIOUSLY Trending! If you currently have an alpaca farm, now is a perfect time to take advantage of utilizing your beloved animals to help increase your audience and customer base. Alpacas and camelids in general have been trending in media and advertising throughout the course of the past couple years. Through this steady exposure, people have been getting increasingly excited about alpacas even without knowing much about the animals. By putting your alpacas, farm, and products out there, it gives you a wonderful opportunity to expand your customer reach. More than ever, alpacas and llamas have been featured in articles, news segments and commercials -- on average, people are generally more familiar with these animals now than they ever have been in the past. The impact of this increase in awareness has become so prevalent that people are beginning to include them in some of the most important days of their lives! With the joy alpacas bring with their smiling faces, who wouldn’t want them present? Could these wedding photos be any more perfect? Alpaca shows have generated a lot more foot traffic these days due to giving people the opportunity and incentive to interact with the animals. We have been seeing more and more “alpaca selfie booths” where people can have their very own picture with an alpaca. Additionally, shows have included an alpaca costume contest, where typically a child will pair up with an alpaca for a duo costume role. These are the kind of experiences people are looking for -- once they can engage with the animal and appreciate it for what it is, there will likely be sparks of curiosity for the benefits, overall caretaking and use of the animal and its fiber. Large companies such as Bank of America have been hopping on the camelid themed bandwagon with their #LLOVEYOURAPP campaign, where they feature a talking llama to advertise their banking app. It is obvious that llamas have nothing to do with Bank of America’s business, but their overall likeability, and the general public's curiosity for them, make them a perfect fit in their advertising campaign. If you keep your eyes peeled, you will notice a more prominent alpaca / camelid theme showing up in retail stores. Whether it be clothing, stuffed animals, or home decor, these animals are on the rise more than ever before. Although these products are not made from alpaca fiber themselves, they increase the general public’s awareness of alpacas and the camelid family as a whole. As the “brand” of alpaca increases, more people are having their interest piqued in regards to these animals, the farms in their communities, and ultimately the products made from their fiber. A great example of an alpaca who has gone viral on the internet is Chewy out of Adelaide, Australia. He belongs to a 14-year-old boy named Matt whose parents disagreed on getting him a dog, and instead surprised him with an alpaca. There is nothing in particular about Chewy that has made him a worldwide internet sensation other than his social media outreach. People are able to follow Chewy’s life through Instagram at @chew_paca, an account that has nearly 25,000 followers. The entire account contains cute photos of Chewy partaking in everyday activities with his human, Matt. Chewy may have a more exuberant life than most alpacas, but that is because he is treated as the literal equivalent of a pet dog in this family. One takeaway from the Chewy phenomenon is the power of social media to reach your target demographics and bring exposure to your farm and alpacas! Thousands of people have become newly educated on alpacas solely because Chewy was all over news stations and online publications, and those stations wouldn’t have discovered Chewy if it weren’t for his internet presence, especially on Instagram. One thing that is of primary importance on Instagram is the use of hashtags. This is the number one way to reach new people and cater to their exact interests. For example, you can simply hashtag #Alpaca or you can choose something on a bit of a wider scale, such as #MadeInTheUSA or the increasingly trending #KnitPicks hashtag. Be sure to check out some other all-star alpaca accounts as well such as @alpacasofinstagram and @alpaca.gram -- take a look at their photo content and use of hashtags to see how they’ve become successful in spreading the alpaca love! If you’re in the alpaca business, you have quite the upper hand considering how much of an internet and media sensation alpacas have become. To most, alpacas are still exotic creatures that they don’t get the opportunity to see -- people are unaware that there is most likely an alpaca farm closer to them than they think. Take advantage of the excitement these animals bring to people. Perhaps offer an “alpaca selfie booth” at your farm or next event -- give your customers incentives towards your products if they share their alpaca selfie on social media with your farm name tagged in it. That way their friends can see and share it, giving your farm more exposure to the public, expanding your potential customer base and bringing more awareness in the community to your farm. Many people, especially a younger crowd, love new experiences just as much as they love new products. Luckily for you, you can give them both with these adorable and fascinating animals! Our first production run of our BOLD Boucle Lined Alpaca Mittens are now available at fiber and wholesale price points. We've taken one of our best selling products and added a splash of color! 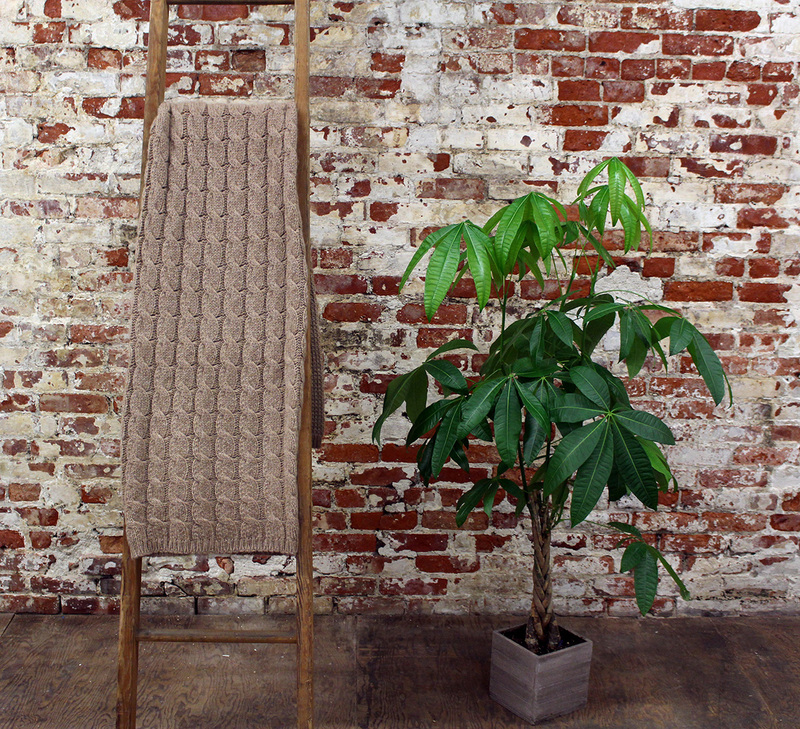 New Product: Big Cable Alpaca Blanket! 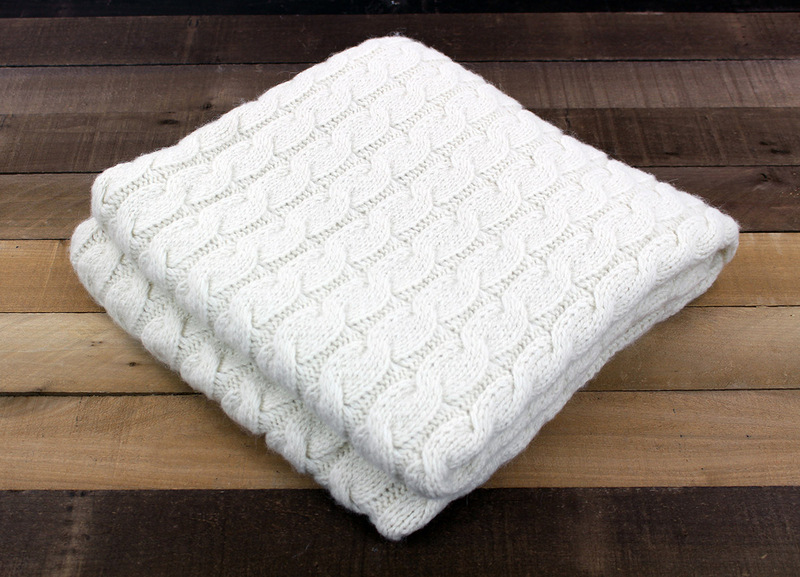 Big Cable Alpaca Blanket - New Product Release! For our Big Cable Alpaca Blanket, we started with the warmest, softest, most comfortable all natural fiber grown in the country, U.S. Alpaca. The natural breathability and moisture wicking properties of the alpaca combined with the loft of the oversized cable knit pattern make a blanket that will keep you warm and comfy year round. It’s generous size, hefty weight, and lush texture, make it perfect for layering over a bed, or draping over a love seat or sectional. The alpaca fiber in this blanket is grown across the U.S. on alpaca farms and spun into yarn in a century old spinning mill in Massachusetts. 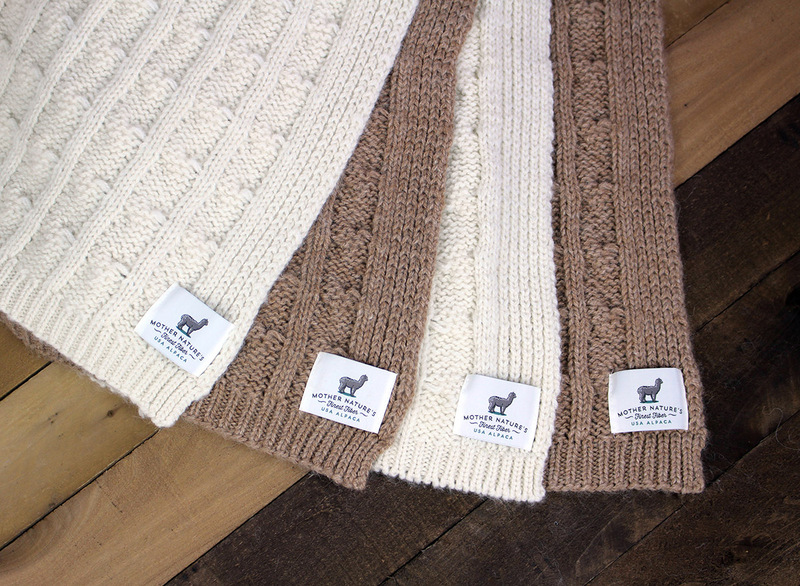 The alpaca yarn is knit into fabric in a 3rd generation knitting mill in New Jersey. Once knit, the blankets head back to us here in the Spindle City, Fall River, MA, where we cut, sew, and finish these beautiful blankets. The evident quality and finesse of this heirloom blanket truly adds more “home” to your house. A perfect gift for someone who has it all and appreciates the best. NEAFP Note: A Boot Sock Sneak Peak + NEAFP News! Read the NEAFP Note here! One of the great advantages of bringing your alpaca products to local events and farmers markets is you're surrounded by like minded vendors, catering their businesses to the needs of the community. Connecting with like-minded businesses and finding ways to work together can be mutually beneficial. The key is finding a business that you are not in direct competition with, but share the same demographics. For example, if you are selling U.S. made alpaca products, you will likely have success cross-promoting with a business that shares your target demographics, such as a local craft brewery, a handmade soap maker, or a dog treat bakery! There are plenty of innovative ways to promote another business while trying to sell at yours. For the purpose of this blog, let’s say you do decide to co-market or co-campaign with a local craft brewery. Each of your demographics involves people that most likely appreciate quality goods, craftsmanship, and locally produced goods. By cross-promoting with a local craft brewery, you are both targeting the same type of audience, but your service offerings are totally different. So how is it that you begin this cross-promotion process? Reach out to a local business that you find reaches a similar customer base and propose some ideas that will be helpful for each of you. There are several ways you can go about this that really don’t require much work. You could each display each other’s promotional flyers or business cards at your businesses so that more people can see them. The idea that one business is vouching for another business certainly can attract and strike interest in potential customers. Another option could be to exchange coupons with another local business. For example, if a customer buys two or more items from your store, they could perhaps get a coupon for a free or discounted draft beer from the local brewery. If a customer buys a pitcher of beer at the local brewery, they could get a 10% off coupon on their next order at your farm store. Another good method could be to create a new pop up market or event altogether. You could invite the handmade soapmaker to vend with you at your next holiday event or open house during a weekend at your farm. By the two businesses working and promoting something together, each of you are sharing your respective audiences to boost your clientele. Recurring customers for the organic produce become new customers of yours, and vice versa. Again, each of you are targeting the same demographic, but are selling totally different goods. People have an appreciation for established connections between small businesses, and doing an event together, whether big or small, could prove to be successful for both your farm store and whoever it is you choose to work with. Listed above are just a handful of ways you can utilize co-marketing / cross promotion with like minded, non competing businesses. Sit down and give some thought on local business types that would make a good fit, as well as ideas on how you can work together to make the arrangement mutually beneficial. Chances are you already have a vendor friend or two at the local market, they may even be one of your best customers! The next time it’s a slow rainy day at the market, have a brainstorm session on how you both can work together to make your small businesses that much more successful! NEAFP is hiring 2x Production Assistants! NEAFP is growing and looking to increase our team in order to meet the challenges of the U.S. Alpaca fiber industry. We are adding 2 full time Production Assistants to help with the increase of raw fiber coming in to the mill and the growing amount of finished products heading out the door! Here is the full job listing (with a link to apply at the bottom)! The New England Alpaca Fiber Pool (NEAFP) is an agricultural service provider to U.S. Alpaca farms looking to process their alpaca fiber in the U.S. on a commercial scale. We manage the pooling of raw alpaca fiber coming off thousands of farms and oversee the manufacturing process from raw fiber off the animal to finished good ready for shelf. NEAFP was started in 1997 and located in Fall River, MA. We are looking to hire a full time (40 hours per week) production assistant to help in several different operations around the mill. Compensation / Benefits: $11 per hour to start. Benefit Packages available after introductory employment period. Why would you be a good fit here at The New England Alpaca Fiber Pool (NEAFP)? We are happy to announce that we will be vending and running a Fiber Collection at the upcoming Great Western Alpaca Show in Denver, CO! This is a great opportunity for farms in the area to get their fiber to NEAFP for free as well as check out our products and start stocking your farm stores for the Fall and Winter Sales season. This collection's fiber will be palletized and NEAFP will cover the freight trucking charges back to our mill in Fall River, MA . ALL Fiber must be BOXED for this collection. Each box must be packed tightly with fiber, no excess air! That’s it. From their your fiber will make it’s way back to NEAFP for Free! Need a FiberBank account? Head here! **We will not be collecting Third-grade fiber at this show's collection due to the increased cost of shipping it across the country. Earlier this year Bill S490 was introduced in the MA State House of Representatives that would ban all wild and exotic animal shows and displays in the state. Due to the bill being poorly written and vague, both LLAMAS and ALPACAS would be considered an exotic animal in this proposed legislature. Currently the bill has been referred to the Joint Committee on Environment, Natural Resources and Agriculture for review and there will be a hearing on it (date not yet set). NEAFP is actively in contact with state legislators and encourage all alpaca farms in MA and all of New England to speak out in OPPOSITION of Bill S.490. Thank you for taking the time to tour the New England Alpaca Fiber Pool facility last Friday. Knowing your commitment to agriculture, the environment and the economy, it was a pleasure to give you a tour of our unique business in Fall River. In an age where slow food and slow fashion have come en-vogue, the commonwealth has successfully leveraged its cultural diversity and historical background to benefit greatly from both the culinary and fashion impact of these trends. LLama and Alpaca plays a key role in the slow fashion trend in that they have been a domestic farm animal for over 5000 years and as a result are easy to care for, resilient to disease, require low food and water and are small and stress free animals. These attributes are well suited to small agricultural initiatives that seek an alternative livestock model while allowing small farms to participate in natural fiber / slow fashion that is both profitable while having low impact on the environment. Re-categorizing a Llama or Alpaca as an exotic animal is a poorly conceived notion. South America has domesticated these animals for over 5000 years and are very much equivalent to our own sheep and mule. They normally don't exist in the wild. Slow Fashion is the next big thing for agriculture where natural fibers will play a pivotal role. The small footprint of our state does not immediately lend itself to large farms, however, it is well suited to small diverse farms where locally grown and locally made products are a priority. Massachusetts and especially the Southcoast does have a long historical background of processing natural fiber ( wool & cotton) and a strong ready made infrastructure waiting to be revitalized. Our century old textile mills are the perfect place to promote a new fashion movement and we should do what ever is in our power to promote that activity. Certainly, re-categorizing a well established fiber producing animal as exotic does not help facilitate that goal. Manufacturers are interesting in alpaca fiber not because it is exotic but due to the unique advantages it has over wool (soft, moisture wicking, warm). With the increased market demand for merino wool, alpaca provides a unique alternative. Wool is disadvantaged with its tendency to shrink and requires delicate handling. The wool industry solution to this problem is to "Super Wash" the wool using very harsh chemicals with significant impact on the environment. Alpaca does not have the same shrinking problem and does not need to be "Super Washed" and as a result, can be blended with wool and alleviate the negative impact on the environment. Identifying LLama and Alpaca as exotic may cause investors to rethink revitalizing some of our old mills and processing natural fiber in the commonwealth. No such restriction has been adopted by any state that I know of. In closing, I would ask for your help in doing whatever you can to defeat this bill as it may have unintended consequences both on agriculture and the economy. I wanted to take this opportunity to thank you for your input relative to Senate Bill 490, An Act Relative to Wild and Exotic Animal Performance Prohibition, a bill I filed this past January that is currently pending before the Joint Committee on Environment, Natural Resources and Agriculture (ENRA). My intent in filing this legislation centered on those traveling performing acts usually referred to as circuses, as a means to address the often cruel and abusive living circumstances of these creatures. Unfortunately, it has become clear to me that the current language also has the potential to impact local educational enterprises and farms, which certainly do not merit inclusion in a statute of this sort. The points you and other Commonwealth residents, many of whom own small businesses, raised as unintended consequences of Senate Bill 490 as currently drafted certainly point to the fact that the bill warrants a much more thorough analysis and additional vetting by stakeholders and the general public. Please know I have notified the chairs of ENRA as well as the cosponsors of Senate Bill 490 with my request that the bill be reviewed and researched further, including but not limited to the correlation with any applicable federal law or regulation, with the hopes that the committee may advise on more appropriate language in the context described above. I would encourage you to forward to the committee’s attention your personal statement on Senate Bill 490 so that your comments may be considered by the research staff and be included in the material that would be made available to other legislators. I would be happy as well to send along to the committee chairs any statement that you may have emailed to me recently, should this be more convenient for you. I welcome your advice on this; you may feel free to email me directly at Bruce.Tarr@MASenate.gov. Again, thank you for reaching out to me. NEAFP is heading back to Colorado in May! We had such a great time at the AOA National Alpaca Show last weekend that we have decided to head back to Colorado in May for the Great Western Alpaca Show! Although we've been prancing around the mill in full on Spring mode - Winter has other plans for us. 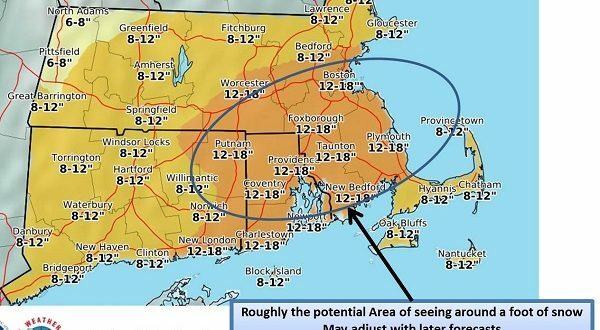 It looks like we will be receiving a serious snow storm (possibly blizzard conditions) starting tonight and stretching until Tuesday Night / Wednesday morning. With the amount of snow projected and high winds we expect to be closed on Tuesday and possibly part or all of Wednesday. All orders that are placed before 11am today (Monday 3/13) will ship out in today's mail. Orders placed during the snow storm will be shipped out by the end of the week - most likely starting on Thursday. For packages shipped end of last week and today, there may take an extra day to arrive as this storm will be stretching from D.C. to Maine. We also will be flying out to Denver, CO on Thursday for the AOA National Show - we expect our travel plans to stay the same but will keep you posted if they do indeed change. To everyone in the storms path, we hope you and your alpacas have a safe, warm, and uneventful snow storm. Thank you for your patience! Carolina Alpaca Celebration, My First Alpaca Show! Carolina Alpaca Celebration - My First Alpaca Show! After six momentous months of working for the New England Alpaca Fiber Pool, and after the bustling surge of the fall and winter seasons, I was given the opportunity to attend my first alpaca show - the Carolina Alpaca Celebration in Concord, North Carolina. I went along for the 13 hour trek halfway down the east coast with Mike Gula, the primary fiber sorter here at NEAFP. We had some beautiful sunshine for the entirety of the weekend which was a nice escape from our brisk and wavering weather patterns here on the Southcoast, Massachusetts. Upon arrival at the Cabarrus Arena Friday morning, we steadily began building our booth among the alpaca that were trickling in from their time on the road. Even though the show didn’t technically begin until the following day, people were already coming to the booth to drop off their fiber while chatting it up with us amicably. We had encountered plenty of folks who were happy to see us and provided us with an overwhelming amount of positive feedback and praise. This had immediately struck me - it was so interesting to hear this type of feedback in person from the other side, so to speak, rather than from behind an email signature on a laptop. It was at this point, before the show began, that I had known how much I would thoroughly enjoy the following two days ahead. We finished hanging up all of our products, labels and decor at around 5pm, leaving plenty of time for us to grab some dinner and do some exploring in the area. Not only have I not been to an alpaca show before, but it was also my first time visiting North Carolina - I wanted to make the most of my experience there. We stopped at Chef Thai & Sushi Bar and indulged in some excellent spicy rolls - our waitress nearly had us in tears from how hilariously entertaining she was. Afterward we stumbled upon the historic Gibson Mill, which housed not one but two breweries - High Branch Brewing Company and Cabarrus Brewing Company. The beers and the atmosphere at each of the two breweries were exceptional - so much so that we visited both two nights in a row! High Branch Brewing Co. | Chef Thai and Sushi | Cabarrus Brewing Co.
On Saturday morning, the Carolina Alpaca Celebration had officially commenced. I was eager to begin meeting people in person that I had only heard about, or had only spoken on the phone briefly with in the past. Before the day got into full swing, I took some time to walk around, get a closer look at the animals as well as all the vendors. I was still very new to this - my only real exposure to a lot of alpaca at once has been during my handful of visits to Golden Touch Farm in Westport MA, the farm in which my bosses, Chris and Shelley Riley own and operate. I tried hard to contain my excitement around all of the regular alpaca folks but really I was struggling to keep my cool as I internally gushed at every adorable alpaca I laid my eyes on. These animals look back at you in such a way that it’s almost as if they are staring right into your heart and soul. I feasted my eyes on an array of beautifully handcrafted products, lavish sweaters and shawls and just about every stuffed animal under the sun made from soft, plush alpaca fiber. I was first drawn to an assortment of accessories made by Courtney Tomchik out of Clemmons, North Carolina - her products are mostly accessories varying from buttons to pendants, all handmade from clay. Each individual product has its own original design etched into it. Courtney told me about the type of glaze she uses for her products, and how they afterward need to be fired in a kiln reaching as high as 2,000 degrees to be finished. I was happy to take home a gorgeous pair of abstractly designed earrings and an alpaca-shaped magnet for my fridge. Courtney was only the first vendor I had stopped to speak with and I already wanted to start giving all my money away - I was in trouble! As the day went on, more and more people continued to drop bags of fiber off at our booth, browse through products that they may have already been familiar with, as well as take a gander at some of our newly featured products that are yet to be released: Classic Cable Alpaca Sweater, Convertible Shawl, and Glittens. It was an enriching experience getting to talk to everyone who either works with or is interested in working with our fiber pool, and to feel that my words were making an impact. It was wonderful to see the joy on people’s faces after having purchased a beanie or new pair of socks for themselves or a loved one. While I had intended to take part in some of the education classes that day, I was too busy soaking in all of the face-to-face interaction, and before I knew it day one was over! That night, Mike and I made some plans with Brianne Harris from Apple Hill Farm to get some dinner, shoot the breeze and have some laughs. It was wonderful to receive insight from her and hear about how she operates the farm. We stopped at Crispy’s Bar and Grill for dinner, which had bacon in just about every single dish on the menu - I certainly wasn’t complaining about that. Sunday quickly rolled around, day two of the Carolina Alpaca Celebration, and I finally was given the time to further expand my knowledge on the wonderful world of alpaca - especially the areas in which I am not well-versed in (which were most areas). With this being said, I’d like to give a huge thank you to Patty Fuller from Poplar Hill Alpacas for taking the time out of her day to show me around and thoroughly explain the objectives of these shows. She showed me the Walking Fleece judging area which had contained up to 70 individual fleeces. Patty also shed light on what the spin off competition is all about, and elaborated on the differences between fiber samples. Lastly, she brought me over to the halter judging, which was my personal favorite part of the show. I was walking around acting as a “sponge”, as she called me, absorbing as much information as I possibly could with my time remaining. I imagine that for alpaca farmers, especially for the ones that have been in this industry for quite some time now, it may be easy to forget how this lifestyle is perceived coming from fresh eyes. I can truly say that my first alpaca show went as smoothly and perfectly as it possibly could have - not only did it change my entire perspective of my position, but it also made me even more appreciative and proud to work for a company like NEAFP. I’ve gained so much respect for an industry that I was entirely unfamiliar with less than a year ago. As I had mentioned to Sean, Shelley and Chris upon returning home, “send me anywhere you want!” and boy did I mean it. I genuinely and wholeheartedly look forward to my next alpaca show experience, and many more in the future to come. If you’re in the area for our next alpaca show in Springfield MA, the North American Alpaca Expo, make sure to stop by and say hello - I’ll be the one staring off at a nearby cria with big, googly eyes. See you then! Read the latest NEAFP Note in full here! Hundreds of alpaca farms across the country are setting up booths at pop up markets each week and we want to share setup experience with all farmers who are out there beating the streets! We are looking for alpaca farms to share pictures of their craft and market booths! We will be compiling a gallery to share with everyone in order to get people thinking of their own setups and how they can improve them for future events. Along with pictures of your setup, we are also looking for any tips and tricks you’d be willing to pass on to fellow farmers. As a little thank you for participating, and your willingness to share with the group, we will be giving away a Suri Lap Blanket to one lucky submitter! Each submission that has both a booth setup picture and a tip or trick will be entered in the give away. NEAFP will be accepting submissions for the next few weeks - once we have enough we will be posting the gallery to our blog and social media pages for all alpaca farms to see and share. The winner of the Suri Lap Blanket will be chosen at random and announced when we publish the gallery and article! We very appreciate you showing us your booths and by sharing them with the alpaca farming community, everyone will take a little something back to make their own events that much more successful! Spring Fever came early: New Closeouts listed! As the title says we have started our Spring cleaning here at the mill a bit early this year and have begun listing some new closeouts, check them out! NEAFP is closed today due to extreme blizzard like conditions. We expect to be back open this Friday, 2/10. All orders will start shipping out then, Thank you and hope you all affected by the snow storm stay safe and warm! We have started to map out our vending / fiber collection for the upcoming Spring alpaca show season. Coming by and seeing us at an alpaca show is a great way to get your eyes and hands on our products as well as drop your fiber off to us and get back to NEAFP for free! Last Fall we had several large regional fiber collection points and big Fall Show collections land on our doorstep at the exact same time and our sorters have been playing catch up ever since. After fiber arrives, it normally takes about 8 to 10 weeks to complete but we are trailing about 4 to 6 weeks behind this schedule. We apologize for the delay, the good news is that we are starting to get back on schedule and expect to have the Fall and Winter's fiber sorted and checked into everyone's accounts around the end of February. Note: Dropped off fiber at a collection point or show and want to place an order? Not a problem - just let us know in the Order Notes box that the required fiber is in queue (specify collection / event) and we will release the order at the fiber price point knowing it's here! EMPIRE 2016: Sorting Complete, Reports going out this week!